Seventh Street and Constitution Avenue, N.W. 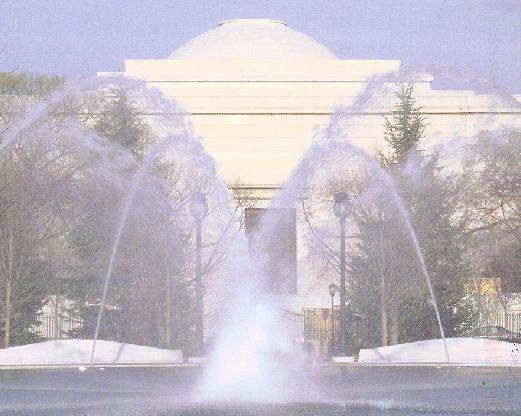 On May 23, 1999 the National Gallery of Art opened a dynamic outdoor sculpture garden designed to offer year-round enjoyment to the public in one of the preeminent locations on the National Mall. The National Gallery of Art Sculpture Garden is given to the nation by The Morris and Gwendolyn Cafritz Foundation. The landscaping of the 6.1-acre space provides a distinctive setting for nearly twenty major works, including important new acquisitions of post-World War II sculpture by such internationally renowned artists as Louise Bourgeois, Mark di Suvero, Roy Lichtenstein, Claes Oldenburg and Coosje van Bruggen, and Tony Smith. The Sculpture Garden is located at Seventh Street and Constitution Avenue, N.W., in the block adjacent to the West Building. "We are proud to bring to the nation these significant works of sculpture in one of the few outdoor settings of this magnitude in the country," said Earl A. Powell Ill, director, National Gallery of Art. "The opening of the Sculpture Garden brings to fruition part of a master plan to revitalize the National Mall that has been in development for more than thirty years. The National Gallery is extremely grateful to the Cafritz Foundation for making this historic event possible. Visitors will be able to enjoy a reflecting pool and fountain in the center of the Garden during the summer months and an ice skating rink in winter. Spacious walking and seating areas will give viewers a chance to rest and reflect on the works of sculpture amid the rich, textural settings composed of native American species of canopy trees, flowering trees, shrubs, groundcovers, and perennials. The renovated pavilion will offer year-round caf 6 service (beginning mid-summer 1999), along with indoor and outdoor seating. "In memory of my parents, Morris and Gwendolyn Cafritz, I am delighted we are able to be part of the Sculpture Garden, which will provide a forum for a variety of cultural and educational programs, as well as a refuge and oasis for the many thousands of visitors who come to the Mall, and for the residents of the greater metropolitan area, said Calvin Cafritz, chairman of the Cafritz Foundation. The design of the Sculpture Garden addresses the importance of the Eighth Street axis line that was part of Pierre L'Enfant's master plan for Washington by providing an entrance on the Mall from Madison Drive and a clear sight line along this imaginary line. The garden is enclosed by a decorative metal fence with marble piers and plinths, designed to reflect the historic character of the West Building. The stone used for the gateway plinths, constructed to articulate the six public entryways to the garden, matches the marble of both the Gallery's West and East Buildings. The granite base beneath the decorative metal fence is the same size and composed of the same material as the raised curb that surrounds the West Building's grounds. The Sculpture Garden is accessible to visitors with disabilities. In August, 1991, the National Park Service and the National Gallery of Art signed an agreement, which was approved by the National Capital Planning Commission, transferring jurisdiction over the Sculpture Garden site from the Park Service to the National Gallery. The design for the National Gallery of Art Sculpture Garden was created by Laurie D. Olin, landscape architect, Olin Partnership, in association with key members of the National Gallery staff: Earl A. Powell Ill, director; Mark Leithauser, chief of design; Gordon Anson, chief lighting designer; James Grupe, senior architect; Carl Campioli, assistant senior architect, and Donald Hand, chief of horticulture. The art was selected by the Gallery's director Powell; Alan Shestack, deputy director; Marla Prather and Mark Rosenthal, the current and former curators of twentieth-century art. Construction on the site was completed by the Chas H. Tompkins Company. Puellae, 1992, by Magdalena Abakanowicz (Polish-born 193O). Composed of thirty diminutive (three-feet high) bronze figures of pre-adolescent girls from the artist's "Ragazzi" series, the sculpture conveys a poignancy and delicacy of scale that sets it apart from the artist's life-size adult figures. It refers to a story the artist heard about a group of children who were found frozen to death in cattle cars as they were transported from Poland to Germany in 1942. It is the first work by this established European artist to enter the Gallery's collection. Gift of The Morris and Gwendolyn Cafritz Foundation. Spider. 1996, cast 1998, by Louise Bourgeois (American, born 1911, France). The ten-foot-by-twenty-four-foot bronze cast with a silver nitrate patina depicts the spider as a looming and powerful protectress who is also nurturing and vulnerable. Belonging to Bourgeois' Spider series, which explores themes of childhood memory and loss, this recently completed work will complement the Gallery's four early works by Bourgeois: Spring (1949), Mortise (1950), Untitled (1952), and The Winged Figure (1950; cast 1991). Gift of The Morris and Gwendolyn Cafritz Foundation. Aurora, 1992-1993, by Mark di Suvero (American, born 1933). This sculpture is a virtuoso performance of design and engineering. Its sophisticated structural system distributes eight tons of steel over three diagonal supports to combine massive scale with elegance of proportion. Gift of The Morris and Gwendolyn Cafritz Foundation. Stele II, 1973, by Ellsworth Kelly (American, born 1923). The shape for this work, one of the artist's first outdoor sculptures, is loosely based on that of a French kilometer marker the artist observed during his years in Paris after World War II. Its title refers to a type of ancient stone monument, which was planar and meant to be seen from the front, as in Stele II. The surface of the weathered steel, after exposure to the elements, has developed an even, non- ref lective surface. Gift of The Morris and Gwendolyn Cafritz Foundation. House, 1996/1998 by Roy Lichtenstein (American, 1923-1997). The sculpture incorporates the hallmark elements of the artist's two-dimensional works: crisp elemental drawing delineated by heavy black outlines and a palette based on primary colors. Exploiting the illusionistic effects of the third dimension, House I appears to project forward from a distance, although it actually recedes into space. Gift of The Morris and Gwendolyn Cafritz Foundation. Typewriter Eraser. Scale X, 1999, by Claes Oldenburg (American, born 1929, Sweden) and Coosje van Bruggen (American, born 1942, The Netherlands). The typewriter eraser, one of Oldenburg's favorite childhood playthings from his father's office, is an image he first used in the 1960s and 1970s as a source for drawings, prints, and sculpture, and even a never realized monument for New York City. In their collaborations, the artists' selection of everyday objects for their large-scale public projects challenges the traditional notion of the public monument as a commemoration of historical figures and events. Gift of The Morris and Gwendolyn Cafritz Foundation. Moondog, 1964/98-99, by Tony Smith (American, 1912-1980). The structure of this work, comprised of fifteen extended octahedrons and ten tetrahedrons, elicits a chain of visual and sculptural associations, including elements of minimal art and architecture and a variety of forms ranging from a Japanese lantern to the human pelvic bone, to which the artist compared it. The title itself is drawn from two sources: "Moondog," the name of a blind poet and folk musician living in New York in the 1960s, and Dog Barking at the Moon, a painting by Joan Miro. Gift of The Morris and Gwendolyn Cafritz Foundation. Thinker on a Rock. 1997, by Barry Flanagan (British, born 1941). The hare in various guises has been the subject of Flanagan's bronzes since 1980. In this work the artist substitutes his signature hare for Rodin's The Thinker (1880), making a witty and irreverent reference to one of the world's best known sculptures. Gift of John and Mary Pappajohn. Four-Sided Pyramid. first installation 1997, by Sol LeWitt (American, born 1928). The terraced pyramid, first employed by LeWitt during the 1960s, relates to the setback design that has long been characteristic of New York skyscrapers. This geometric structure also alludes to the ancient ziggurat form of Assyrian and Babylonian temples. Four-Sided Pyramid will be constructed on the site by a team of engineers and stone masons in collaboration with the artist. Gift of the Donald G. Fisher family. Chair Transformation Number 20B, 1996, by Lucas Samaras (American, born 1936, Greece). The work, depicting an animated flight of stacked chairs, belongs to a series in which the artist represents the chair in a variety of guises and materials, including wire mesh, wood, string, and mirrored glass. The fantastical composition evokes a hallucinatory realm, in which the object appears to lean back and spring forth at the same time. The Nancy Lee and Perry Bass Fund. Sculpture from the Gallery's twentieth-century collection that will be installed in the garden include David Smith's Cubi XXVI (1965); Joel Shapiro's Untitled (1989); Joan Miro's Personnage Gothique, Oiseau-Eclair (1974. cast 1977); lsamu Noguchi's Great Rock of Inner Seeking (1974); and Scott Burton's Six-Part Seating (1985/1998), a group of polished red granite seats that will be displayed for the first time. Also on view courtesy of the Calder Foundation will be one of Alexander Calder's works, Cheval Rouge (Red Horse) (1974), a bold red sculpture made of painted sheet metal fabricated by skilled technicians and metalworkers at the Biemont Foundry in Tours, France. Open Monday through Saturday from 10 a.m. to 5 p.m.
and Sunday from 11 a.m. to 6 p.m. The Gallery is closed on December 25 and January 1. For general information, call (202) 737-4215, the Telecommunications Device for the Deaf (TDD) at (202) 842-6176, or visit the National Gallery of Art's Web site at http://www.nga.gov. To receive the Gallery's free bimonthly Calendar of Events, call (202) 842-6662. The National Gallery of Art Sculpture Garden is located on the National Mall at Seventh Street and Constitution Avenue, N.W. The National Gallery of Art Sculpture Garden ice skating rink will reopen on November 15, 2000, through March 15, 2001, weather permitting. The rink’s sleek, modern design with clear glass dasher boards creates an open vista throughout the garden and offers skaters the unique experience of viewing magnificent works of sculpture. A state-of-the-art compact disc music system, with twenty-four speakers installed on light poles encircling the rink, provides uniform sound to skaters, without distracting other visitors to the garden. There is a $2.50 fee for skate rental and use of lockers. The new Pavilion Café will serve specialty pizzas, sandwiches, salads, desserts, fresh-baked goods, coffee, hot chocolate, and beer and wine. There is a special menu for children. Refreshments and light fare are also available from carts on the café patios. The National Gallery of Art and Sculpture Garden are closed on December 25 and January 1. For general information, call (202) 737-4215, the Telecommunications Device for the Deaf (TDD) at (202) 8426176, or visit the National Gallery of Art’s Web site at www.nga.gov.